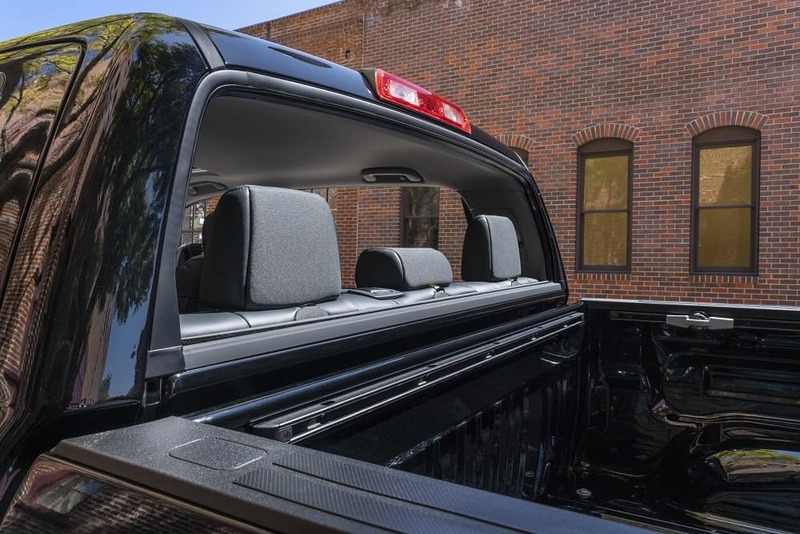 The allure of a pickup truck is the ability to configure it to your specifications, so it fits your personal or even your light-duty business needs. For this purpose, the 2019 Toyota Tundra offers plenty of different options for your ideal truck, no matter what you require from it in the Avon, Indianapolis, and Plainfield areas. At Andy Mohr Toyota, we have dozens of different configurations of the 2019 Tundra on our lot, waiting for you to come make the determination that one in particular would be perfect for your needs. With three distinct choices for your proper bed configuration, as well as different cab options, you can make your Tundra work for you. Short Bed: 5.5 feet gives you plenty of space for all of your tools and equipment for your side business or, even better, that weekend away with the family. This bed choice is available with the CrewMax Cab that offers seating for up to five adults. Standard Bed: Step your game up a bit with an available 6.5-foot bed that makes moving your college buddy’s recliner from his old apartment to his brand-new home a snap. Load up the bed and then prepare yourself to be the go-to moving guy for all of your friends. Long Bed: With 8.1 feet of space in the bed, you’ll have no issue getting your new king-size bed home from the store, as well as the rest of your new bedroom furniture. Maybe you’d prefer bringing home an 80-inch television. No matter your needs, you’re working with more than enough space. The proper configuration of your truck is completely up to how you’d like it. However, Toyota provides some exciting accessories that can offer the ultimate customization. 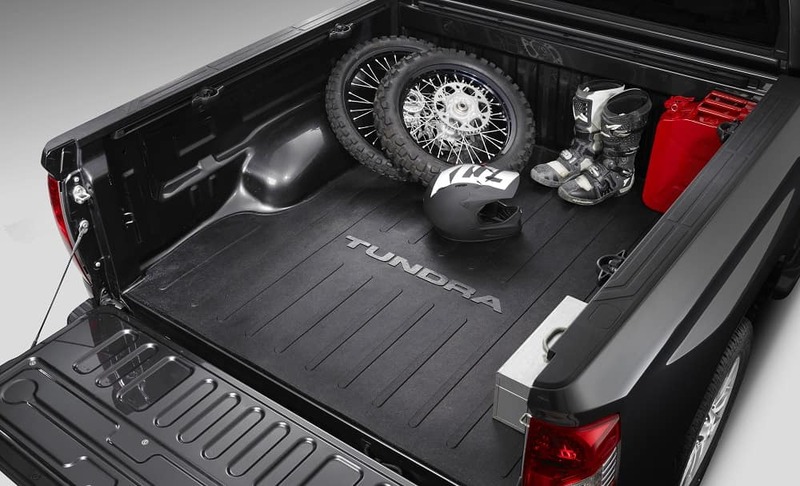 Whether you’re an outdoorsman with plenty of gear for weekends away, you’re a family man who’s frequently loaded down with groceries, or you use your truck for professional purposes, you’ll find the right accessories to make the Tundra your own. Bed Extender: If you’re planning on loading your truck with awkwardly shaped items that may extend past the manufacturer dimensions, this powder coated finished extender adds two feet to your truck when the tailgate is down. Bed Lighting Kit: Take the guesswork out of unloading your truck at night and get a firm grasp on everything contained in the bed with this lighting kit. It uses six LED lights along the inside of your bed to shine some light on the situation. Bed Mat: If you’re the guy who gets called to help your friends move or to transport their sharp, dirty, or abrasive tools, then you’ll want to get yourself the bed mat. Designed to prevent gouges, scratches, or dents to the surface of your truck bed, this rubber liner resists rusting and cracking. Cargo Divider: Using the truck bed’s side rails to promote easier sliding, this cargo divider allows drivers a better way to transport their tools, while keeping them safe and separated. BedStep®: Make unloading a snap with this 300-pound capacity step that allows you to get to a better level when pulling your gear out of the bed for your camping trip or other weekend excursion. When you’re looking for the ideal way to customize your new truck, choose the bed that fits your needs for everything in your life in the Indianapolis, Plainfield, or Avon area. However, to take it one step further, speak with your Andy Mohr Toyota sales team member to add in that little something extra that’s really going to make it yours. Come test drive a 2019 Tundra today at our Toyota dealership, and let’s get started on decking it out.